WASHINGTON, DC -- At his first press briefing after the beheading of American James Foley, President Obama stunned the assembled when he admitted that he had no strategy for confronting ISIS, a.k.a. the Islamic State, in Syria. 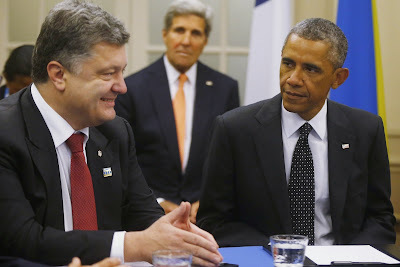 U.S. President Barack Obama is seated with Ukraine President Petro Poroshenko as they meet with other countries regarding Ukraine at the NATO summit at Celtic Manor in Newport, Wales, Thursday, Sept. 4, 2014. At rear center is U.S. Secretary of State John Kerry. Yet it was not nearly the most egregious, or consequential, thing he said. You’re the leader of the free world. Even if you don’t have a strategy — indeed, especially if you don’t — you never admit it publicly. However, if Obama is indeed building a larger strategy, an air campaign coordinated with allies on the ground, this does take time. George W. Bush wisely took a month to respond to 9/11, preparing an unusual special ops-Northern Alliance battle plan that brought down Taliban rule in a hundred days. We’ll see whether Obama comes up with an ISIS strategy. But he already has one for Ukraine: Write it off. And just to reaffirm his indifference and inaction, Obama mindlessly repeated his refrain that the Ukraine problem has no military solution. Yes, but does he not understand that diplomatic solutions are largely dictated by the military balance on the ground? Vladimir Putin’s invasion may be nothing new to Obama. For Ukraine, it changed everything. Russia was on the verge of defeat. That’s why Ukraine is welcoming a cease-fire that amounts to capitulation. A month ago, Putin’s separatist proxies were besieged and desperate. His invasion to the southeast saved them. It diverted the Ukrainian military from Luhansk and Donetsk, allowing the rebels to recover, while Russian armor rolled over Ukrainian forces, jeopardizing their control of the entire southeast. Putin even boasted that he could take Kiev in two weeks. He’s already fracturing and subjugating Ukraine, re-creating Novorossiya (“New Russia”), statehood for which is one of the issues that will be up for, yes, diplomacy. Which makes incomprehensible Obama’s denial to Ukraine of even defensive weapons — small arms, anti-tank and anti-aircraft missiles. Indeed, his stunning passivity in the face of a dictionary-definition invasion has not just confounded the Ukrainians. It has unnerved the East Europeans. Hence Obama’s reassurances on his trip to the NATO summit in Wales. I’m sure they sleep well tonight in Tallinn now that Obama has promised to stand with them. To back up Obama’s words, NATO is touting a promised rapid-reaction force of about 4,000 to be dispatched to pre-provisioned bases in the Baltics and Poland within 48 hours of an emergency. First, we’ve been hearing about European rapid-reaction forces for decades. Second, even if this one comes into being, it is a feeble half-measure. Not only will troops have to be assembled, dispatched, transported and armed as the fire bell is ringing, but the very sending will require some affirmative and immediate decision by NATO. The alliance is famous for its reluctant, slow and fractured decision-making. By the time the Rapid Reactors arrive, Russia will have long overrun their yet-to-be-manned bases. The real news from Wales is what NATO did not do. It did not create the only serious deterrent to Russia: permanent bases in the Baltics and eastern Poland that would act as a tripwire. A Russian leader would know that any invading force would immediately encounter NATO troops, guaranteeing war with the West. Which is how we kept the peace in Europe through a half-century of Cold War. U.S. troops in West Germany could never have stopped a Russian invasion. But a Russian attack would have instantly brought America into a war — a war Russia could not countenance. It’s what keeps the peace in Korea today. Even the reckless North Korean leadership dares not cross the DMZ, because it would kill U.S. troops on its way to Seoul, triggering war with America. And what any rapid-reaction force cannot provide. In Wales, it will nonetheless be proclaimed a triumph. In Estonia, in Poland, as today in Ukraine, it will be seen for what it is — a loud declaration of reluctance by an alliance led by a man who is the very embodiment of ambivalence.